Many Samford University students are using January to experience life in places around the globe, and to serve others near and far. Of the 1,000-plus students who are enrolled in Jan Term, about 180 are traveling the world in courses led by Samford faculty and others. And in an increasingly popular Jan Term alternative, about 350 students are taking at least one online course. A number of students are participating in independent mission projects that are sponsored by a variety of global ministries and local churches. Places of service for some undergraduate students include Haiti, Honduras, Nepal and a children’s home in Calcutta, India. Students in a Brock School of Business economics and poverty course will spend a day helping Birmingham’s Christian Service Mission build a house in an impoverished area of the city. Meanwhile, eight Beeson Divinity School students are spending portions of January serving in in the Middle East, Rwanda, Czech Republic and Brooklyn, New York. While some familiar courses have been part of the Jan Term roster for decades, others are getting a roll out for the first time this year. Alan Jung’s new course, “The History and Culture of English Football,” drew six students who wanted to discover the social influence of the sport and learn firsthand how it impacts all aspects of culture in England. Besides tracing its history from the 1800s to today’s status as the world’s most popular sport, they learned about the inner workings of leagues and tournaments. Midway through the two-week course, they had already attended five matches and toured four stadiums in and around London. Through observation and interviews, the students came away impressed by the deep loyalty of local fans. 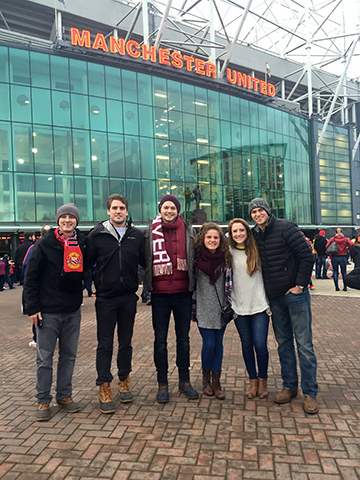 “The passion and enthusiasm that the English have for their local football club is second to none to any college or professional football game back home,” said Drew Jackson, a senior finance major from Pelham, Alabama. Other students who are based at Samford’s Daniel House in London are studying arts appreciation, French and British history, international photojournalism and nursing in the British Isles. Elsewhere in Europe, two groups, including 45 University Fellows, are in Italy, and one group is in Greece. In India, senior interior architecture students are doing preliminary work on a Design Education for World Impact (DEWI) project for a medical clinic they will help design and build in Calcutta. Jan Term sites in the Americas include Peru, the Caribbean island of Saba, the Dominican Republic and Costa Rica, where nutrition and dietetics students have immersed themselves in rich cooking traditions and culture. They have surveyed foods, eating habits and customs while experiencing the geography, history, politics, religion and agriculture of the Central American nation. “They have been up a volcano, down a river with monkeys and crocs, and are cooking up a storm in just the first two days,” reported nutrition and dietetics professor Pat Terry. Stateside course locations include Orlando, Florida, where a class will spend a week researching how the Disney Company creates its magical experience. They took the first portion of the class online. The course, which explores Disney’s organization structure, history and social impact, is one of many courses that use online study for some or all of its content. In fact, the 356 students who are taking at least one online course may represent the highest number ever for Jan Term. Dana K. Basinger, assistant dean of Howard College of Arts and Sciences, feels confident that her school’s 128 online students comprise a record this January. “We didn’t know how students would respond to the online course offerings, but they’ve proved quite popular. Jan Term is ideal because students who want to stay at home during the term can get ahead on courses and use their time wisely,” Basinger said, adding that the arts and sciences online courses are primarily in general subjects — such as math, science and communication — so that a wide variety of students across the university have the opportunity to enroll. She notes that the same courses are also taught in the summer term, and have proved popular at that time as well. Primarily, students take online courses from their homes, but they can live on campus and take them if they choose, she said. Basinger dispels any perception that online courses may be easier than classes that are taught the conventional way. “Online courses certainly aren’t less work than on-campus courses. They require a heightened level of student engagement, and that’s probably why students actually enjoy them. “Many of our students report that they have discovered that they have a higher level of engagement with their professors as well — which is often a surprise to them,” she said. Most Jan Term classes end Jan. 21. Spring semester classes begin Monday, Jan. 25.